Mindy English received her teacher certification from the National Academy of Needlearts in 1984, when it was still under the auspices of Valentine Museum. At the close of her Level II year her piece Jacobean Flowers was chosen for inclusion in the permanent collection of the Academy. This is the highest honor conferred on a candidate by the Academy and Mindy’s piece was only the seventh to be so honored. Mindy was born in Jacksonville Florida, and grew up in Hinsdale Illinois, but, a true daughter of the South, she returned to Dixie for college, attending Sophie Newcomb, the women’s college that was part of Tulane University in New Orleans. After college she married and had two daughters, Mary and Sarah, and the family moved to Atlanta Georgia. Later Mindy was blessed with 3 grandsons, whom she cherished with a passion. Mindy taught extensively throughout the United States at chapters and regional seminars all over the country, as well as numerous national seminars for EGA, ANG, Callaway Gardens, Valentine, and NAN Assemblies. Early on, her designs were published in McCall’s Needlework and Craft magazine, and she was a frequent contributor to Needle Pointers for ANG, and for ANG’s Chapter Project Booklet. Mindy is well known for her series of books she published, all under the heading of The Canvas Embroidery Notebook. Volumes include “Stitches”, “Backgrounds,” “Borders,” “Filling Stitches-Cross and Eyelets”, “Filling Stitches-Tied Variations, and “More Filling Stitches”; these are valuable resources for stitchers everywhere. The books evolved from Mindy’s Level II presentation which was entitled “Exploding Stitches.” In it she experimented with well known, mainstream needlepoint stitches, making them larger, turning them on the canvas grid, combining them with other stitches, moving them apart, and in general creating a whole new array of stitches for the needleworker to use. Mindy loved her computer, and almost abandoned her embroidery for it, but employed it for developing stitches and combinations thereof, and sharing them with her books. Her best known designs where those in her Jacobean series, which included exquisitely rendered flowers based on designs for crewel embroidery but interpreted on canvas with complex, subtle backgrounds. Her swan designs –there were three of them–also received great critical acclaim. Mindy excelled in taking traditional designs intended for crewel embroidery — which was almost exclusively worked on linen fabric — and interpreting them on canvas. These designs were characteristically exaggerated floral designs, which offered the embroiderer an opportunity for much expression with stitches. They are also typically worked showing dimension with shading. The stitches employed are often raised and textured for added interest. Mindy began this piece by completely working the background (14-count canvas) in two very close values of embroidery floss, white and ecru. She made a grid-like or perhaps trellis like, design for the background, which was very subtle. then she began her embroidery, using mostly Persian wool, or Medici Wool. Occasionally some fine details were done in embroidery floss. The large stylized leaves at the bottom of the design, and the demi-lune shape of the yellow flower were worked in laid fillings, couched down. Stem stitch filling is employed for the green-to-yellow leaves, with a value change for each row of stem stitch. 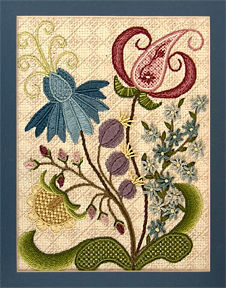 Mindy also employed other traditional crewel stitches like chain (the stamens emerging from the blue flower, and several outlines). Bullion Knots are used for the stamens of the purple flowers, and French Knots for the centers of the small blue flowers, which are worked in needleweaving. Other stitches include Lazy Daisy, Ribbed Spider, and Satin. This idea of interpreting crewel designs on canvas, but combining the surface stitches with those of canvaswork proved so engrossing to Mindy that she worked a number of other pieces in the same vein, different shapes, different sizes, always different flowers, and always just as appealing.